MTG砂砾冲击试验机 MTG gravel impact test enginery 仪器介绍:(MTG)是特为汽车材料及表面涂层的抗砂砾碰撞试验而设计的. 它符合SAE、ASTM、VDA、JIS、通用、福特、克来斯勒、马自达、日产、大众及丰田等的测试要求. Instrument is introduced: (MTG) is reserved for automobile materials and surface coating resistance of the gravel crash test designed. It is in line with the SAE, ASTM, JIS, VDA, gm, ford and grams to caleb, Mazda, nissan, Toyota, Volkswagen and such testing requirements. Due to the new gravel multi-function tester is by standard assembly made of, and equipped with easy handling accessories, so you can be in a tester on all major auto material gravel crash test. Gravel multi-function impact test enginery main standard components are: shot gun components, collision chamber and specimens grippers. New gravel tester's unique design can make the daily hundreds of times test. Gravel multi-function impact test function of rapid specimens of loading and unloading and equipped with external extended grit boxes, convenient and practical. 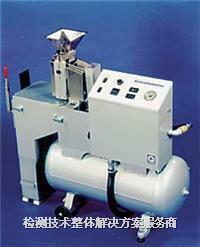 In addition to grit tester can also test parameters more precise control, and can make meet ISO9000 test calibration.